You’ll be green with envy if you don’t take a bite into today’s sweet and juicy food of honor. December 21 is National Kiwifruit Day! Alternatively, some calendars list today as National Hamburger Day, but others show that as May 28 (we celebrated brisket). There was also a National Cheeseburger Day in September, so we’re going with kiwifruit (only I’m shortening it to kiwi, since that’s what many people call it, and it’s less cumbersome to type) instead. Kiwi is the edible berry of a woody vine native to China, and has actually been declared a National Fruit of China. In the early 20th century, Mary Isabel Fraser – principal of a girl’s college in New Zealand – brought back kiwi seeds after visiting mission schools in Yichang. The seeds of the Chinese gooseberry, as the fruit was known back then, were planted in 1906, and began fruiting in 1910. The fruit was popular with American servicemen stationed in New Zealand during World War II, and plans were made to market and export the fruit to the U.S. Not feeling the name was an accurate representation of the fruit, it was changed to melonette, but the importer was unhappy because melons and berries attracted high duties. Exporter Jack Turner suggested the name “kiwifruit” in 1959 because both the fruit and New Zealand’s native bird, the kiwi, were similar in appearance – small, brown, and furry. The name has stuck ever since (except in China, where it is now known as the Macaque peach. 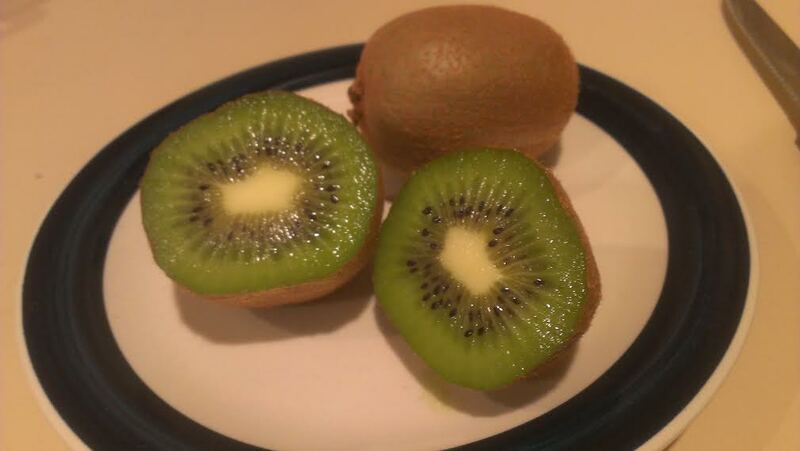 Whatever you call it, kiwis are delicious! The easiest way to eat them, I learned long ago, is to slice them in half, and then scoop out the sweet flesh with a spoon. Which is exactly what we did this morning.